The SynthArray-24 is a reactor system designed for running multiple synthetic chemistry reactions (24) under a variety of conditions. The reactor is designed to be simple when used for simple tasks with functionality (inert atmosphere, reflux, e.g.) added as needed. The reactor uses inexpensive disposable 13 mm screw-cap culture tubes as reactors. As is the case with a standard round bottom flask, a tube holder holds the tubes at the top, allowing greater reaction visibility, more options for temperature control and simpler methods for adding functionality. 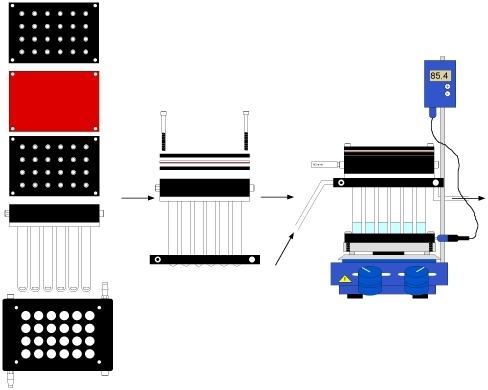 The SynthArray-24 has the standard SBS microtiter footprint, allowing simple integration with automation and other equipment and supplies such as filter plates. The SynthArray-24 system is comprised of six pieces plus a parts kit. 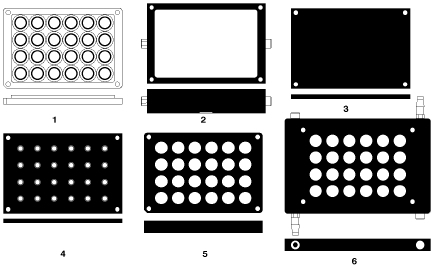 As shown in Figure 1. they are the tube holder 1, the sleeve 2, the solid top 3, the top with holes 4, the heater block/alignment guide 5 and the heat transfer block (condenser) 6. The tube holder 1 is made of Teflon and the other parts are of aluminum. Parts 1-4 have holes in the corners through which screws can pass. Parts 5 and 6 have threaded holes (size 10-32 UNF) in the same positions. Figure 1. SynthArray-24 reactor parts: Tube holder 1, Sleeve 2, Solid top 3, Top with holes 4, Heater block/alignment guide 5, Heat transfer block (condenser) 6. The central piece of the SynthArray-24 is the Teflon¨ tube holder 1. The holder has a centered 4 x 6 array of 24 holes (18 mm spacing) with embedded o-rings that serve to hold reaction tubes and provide a gastight seal. The sleeve 2 is used to form a cavity around the tube openings for holding an atmosphere. There are two 1/4-28 inlets in the sleeve. One is fitted with a Leur adapter for attaching a gas inlet and the other comes closed with a removable plug. There are two tops, 3 and 4, which are interchangeable depending on the application. 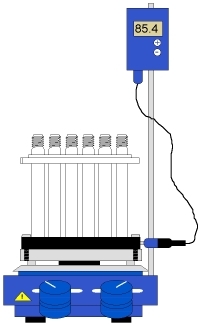 The heater block/alignment guide 5 can be used to align the tubes in a microtiter array when used with robotics or as a heat distributor, when placed on a heated surface. The heat transfer block 6 is plumbed with two tubing connectors on diagonal ends to allow a liquid to circulate through the block. It can be used to control reaction temperature when the block is placed at the bottom of the reactor tubes or can serve as a condenser when the block is used at the top of the tubes. The SynthArray-24 system parts kit includes an Allen wrench, an assortment of screws, a few replacement parts, two red Teflon-face silicone septum sheets and a dime. Where they're used and why will be described below, though it's worth mentioning here that there are three types of 2" 10-32 screws. Four screws are used to assemble the SynthArray-24 and any one of the three screw types are OK. The stainless steel screws are standard. The nylon screws are useful for people with a heavy hand, to avoid ruining the threads on parts 5 or 6 during assembly. The thumb screws are used when someone takes your Allen Wrench, as will always happen. The simplest setup is just the tube holder with twenty-four of the 13 mm culture tubes inserted. There are a number of ways to insert the tubes into the holder. We'll describe a few. For starters, always address the tube holder with the notched corner at the bottom left. This assures that the offset edge of the holder is up and helps one avoid mixing reactions by rotating the holder 180 degrees. One can just press the tubes into the holder by hand. It's a little easier if you wet the o-rings with something first. A touch of water, alcohol or mineral oil works fine. To get the tubes in evenly, snap the sleeve 2, onto the tube holder 1, with the dime slot toward the holder 1 and place it upside-down on something soft like a recent issue of JACS. Place the heater block/alignment guide 5 on top and drop twenty four 13 mm culture tubes, screw top down, into the holes. 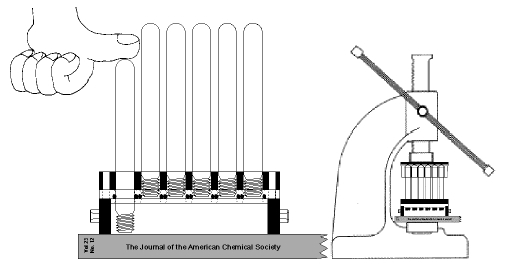 Then just press down on the tubes until they touch the journal as shown in the cutaway drawing in Figure 2. Figure 2. Inserting tubes, by hand or with assistance. 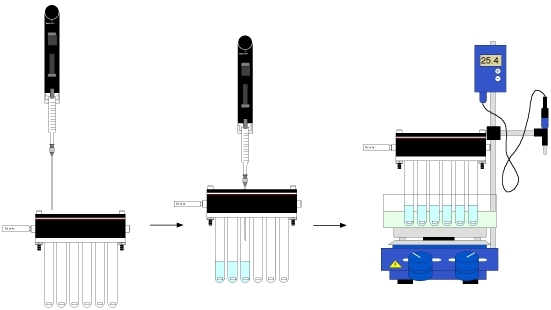 If you have something like an Arbor press, you can do all the pushing in one step, by placing a 24 well plastic titer plate on top of the tubes and pushing all the tubes in at once as shown in Figure 2. Once the tubes are in, remove the alignment guide 5, slip a dime into the dime slot and twist to pop off the sleeve 2 and you have a holder with 24 tubes as shown in figure 3. For some fraction of organic reactions, the reactor, as shown in Figure 3. is adequate. For agitation and heating, drop stir bars into the tubes and place in a heater block/alignment guide 5 sitting atop a stirring hotplate. 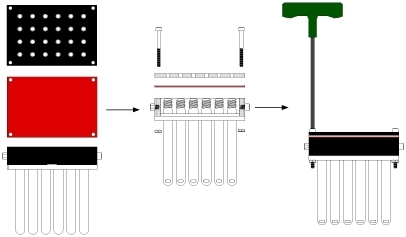 If you're using an IKA stirring hotplate equipped with the temperature controller and short probe (as sold by InnovaSyn), insert the probe into the hole of the heater block/alignment guide 5, set the temperature, turn on the stirrer and you're on your way as shown in Figure 4. If you choose, the four short (10-32 UNF 1") screws, included in the kit, can be screwed into the heater block 5. The protruding threads hold the block on the stirrer. Figure 4. Simple setup on a hotplate stirrer. 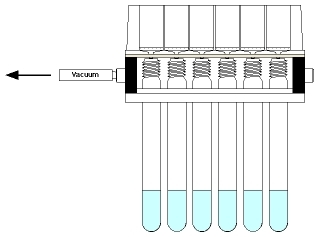 To run reactions under an inert atmosphere while maintaining needle access to the tubes, start with 24 tubes in the holder with the sleeve attached as shown in Figure 3. This is a good time to add stir bars if you're going to use them. Place the silicone septum sheet over the tubes, red Teflon side down, followed by the top with holes 4, with the chamfered (widened) side of the holes pointing up. Insert four 2 inch screws in each of the corners and secure with the included nuts. This is shown in Figure 5. Figure 5. Assembly for simple inert atmosphere. You could then place the reactor block on a stirrer, plumb it with an inert gas through the sleeve and add reagents through the septum top. Temporarily loosening the plug on the opposite end of the sleeve allows for purging the system with gas. 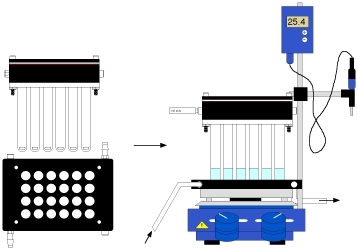 If you wanted to run a reaction at low temperature, you should connect the Leur adapter on the sleeve with a nitrogen or argon source, add solvents with an Eppendorf repeater pipette and place the reactor into a dry ice/acetone bath as shown in Figure 6. You're now ready for further addition of reagents at low temperature. Figure 6. Setting up a low temperature inert atmosphere reaction. It's easy to add a condenser to allow one to run reactions at reflux under an inert atmosphere. As shown in Figure 7. one starts with the inert atmosphere setup, shown in Figure 5. above. First remove the four nuts below the tube holder. Then, place the glass tubes into the heat transfer block 6 and slide the block up until it contacts the tube holder. Screw the four screws into the heat transfer block until tight. 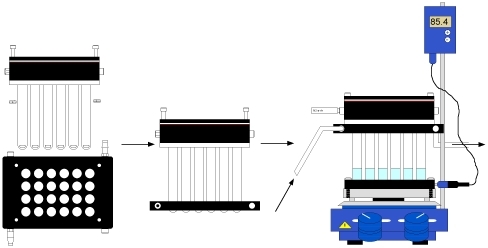 Plump the tubing connectors on the heat transfer block 6 to a cold water source and place in the hotplate/stirrer as described above. Figure 7. Setup for reflux. The SynthArray-24 was originally designed to use a continuous gas source to provide an inert atmosphere and when sealed with the nuts alone, as shown in Figure 5. a reasonable seal is obtained. However, sometimes it is desirable to keep the reactor under a closed system. For example, when using a balloon to provide an inert or reactive (H2 or CO2, e.g.) atmosphere, even a very small leak will quickly deplete the balloon's gas. In this case, the four nuts should be replaced with either the condenser 6 (Figure 7.) or the alignment guide 5, as shown in Figure 8. This minimizes the flex in the Teflon holder and provides a better seal against the sleeve. Addition of silicone grease or sealant on the contacting surfaces will assure a good seal and the reactor should hold a balloon for more than 24 hours. The silicone septum may be supplemented with a thicker silicone sheet if leaking occurs after repeated puncturing. If needle access to the reaction tubes is not needed during the course of the reaction, the solid top 3 can be used in place of the silicone septum and the top with holes 4. One advantage to using the solid top is that one can pull a vacuum on the reactor during a vacuum/purge process without distorting the silicone septum sheet. If needle access is needed along with a vacuum/purge step, one should cap the reaction with two tops with holes 4 with a silicone sheet sandwiched between as shown in Figure 9. Figure 9. Reinforcing the septum sheet. The heat transfer block 6, normally used as a condenser, can also be used to cool or heat a reaction. Simply plumb it to a recirculating heater/ chiller and place it at the bottom of the tubes instead of using the plate alignment guide 5. This is shown in Figure 10. Figure 10. Heating/cooling with the heat transfer block (condenser) 6. To remove the stir bars, one should obtain a very strong magnet. Part number 3038430 from Scientifics Online (http://scientificsonline.com) works very well. As shown in Figure 11. tilt the reactor slightly and move the magnet from the bottom to the top of the tubes. The stir bars within a 2 tube distance will move up the vials and jump out onto the magnet. Repeat until you get them all. Covering the magnet with a paper towel during this exercise will help you remove the stir bars from the magnet and keep the magnet clean. Figure 11. Removing stir bars. These very strong magnets are also good for breaking up precipitates that can form during a reaction. The magnet can be a lot more persuasive in getting the stir bar to move than a stirring hotplate. 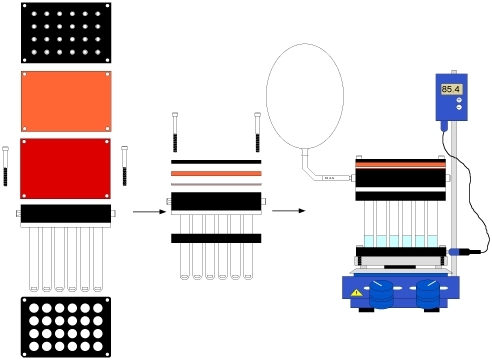 Because the SynthArray-24 is designed on a microtiter plate format, a number of other creative uses can be imagined. For instance, as shown in Figure 12. it's possible to vacuum filter into the reactor through a 24 well filter plate provided you get a good seal between the filter plate and the sleeve. A report describing the SynthArray reactors was recently published in The Journal of Combinatorial Chemistry. Novel Array Reactors for Parallel Synthesis. Philip F. Hughes, Thomas H. Graham and Jose S. Mendoza. J. Comb. Chem. ; 2004, 6, 308-311. A copy of these instructions are available as a word document (1.8 MB) which you can download here.